How can technology help improve our quality of life? How can we navigate the world without using the sense of vision? Inventor and IBM Fellow Chieko Asakawa, who's been blind since the age of fourteen, is working on answering these questions. In a charming demo, she shows off some new technology that's helping blind people explore the world ever more independently ... because, she suggests, when we design for greater accessibility, everyone benefits. Months after he was born, in 1948, Ron McCallum became blind. In this charming, moving talk, he shows how he is able to read — and celebrates the progression of clever tools and adaptive computer technologies that make it possible. With their help, and that of generous volunteers, he's become a lawyer, an academic, and, most of all, a voracious reader. Welcome to the blind reading revolution. Captions for audio and video don’t just help the hearing impaired. For example if your first language isn’t the one being spoken or the presenter has a strong regional accent, captions can help. You could even be in a situation where the device you are using doesn’t have any working speakers or you are in a location where the speaker isn’t loud enough to be heard over the background noise. Having a high contrast between the text and background will help make it easier for low vision users to read the copy on your website. High contrast also helps users trying to view a website on a screen in bright sunlight, or when a user has battery saver mode on or basically any scenario where the screen isn’t being viewed in the best conditions. The mouse or trackpad is utterly useless if you are blind and use a screen reader to navigate your way around the web. Being solely able to navigate the web using just the keyboard is essential. If you don’t require a screen reader being able to navigate the web with the keyboard is still really useful. Some users prefer to tab up and down content with the keyboard instead of taking their hand away to use the mouse. But it really helps when you are using a wireless mouse and the batteries fail. It means you can still carry on using the web with just the keyboard (albeit a little slower). Any effort to make your site technically accessible will be wasted unless your content is written as clearly and simply as possible. People with disabilities experience text in many different ways but so does everyone else. The steps you should follow to create accessible copy will help everyone. What would a city designed for the blind be like? Chris Downey is an architect who went suddenly blind in 2008; he contrasts life in his beloved San Francisco before and after — and shows how the thoughtful designs that enhance his life now might actually make everyone's life better, sighted or not. ¿El futuro será más accesible? Un móvil para ‘ver’ y otros avances para personas con discapacidad: avances tecnológicos que mejoran la vida de las personas con discapacidad presentados en CES 2017. Consumer Technology Association Foundation Hops on Self-Driving Cars: los vehículos autónomos prometen ser una gran solución para las personas mayores o con discapacidad. Son grandes avances, pero, pero... La tecnología avanza en todos los aspectos de nuestras vidas y está demostrado que en muchos casos aumenta la brecha digital entre diferentes comunidades y esto también afecta a las personas con discapacidad. Por ejemplo, las pantallas táctiles han sido un gran problema para las personas ciegas. Ahora todo (lavadoras, microondas, terminales de checkin, etc.) usa pantallas táctiles. Una pantalla táctil sin un lector de pantallas no lo puede usar una persona ciega. El futuro está por escribir, habrá que esperar para poder comprobar si los avances tecnológicos se transforman en una solución o en una barrera. 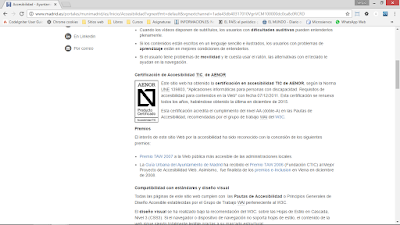 El curso Accesibilidad TIC en compras públicas organizado por UNED y Fundación ONCE se ofrece de forma gratuita a través del canal de cursos abiertos UNED abierta. Sociedad de la Información ¿para todos? Conceptos básicos de las normas. Historia y ámbito de la norma europea de compras públicas. Ejemplos de aplicación de la norma EN 301 549. Árbol de decisión para el uso de la norma EN 301 549. If an aircraft has inaccessible seatback in-flight entertainment systems, it must provide an alternative personal entertainment device (PED) with accessible comparable video content. TalkBack es un servicio de accesibilidad que ayuda a los usuarios ciegos o con deficiencias visuales a interaccionar con los dispositivos. TalkBack incorpora respuestas por voz y con vibración al dispositivo. 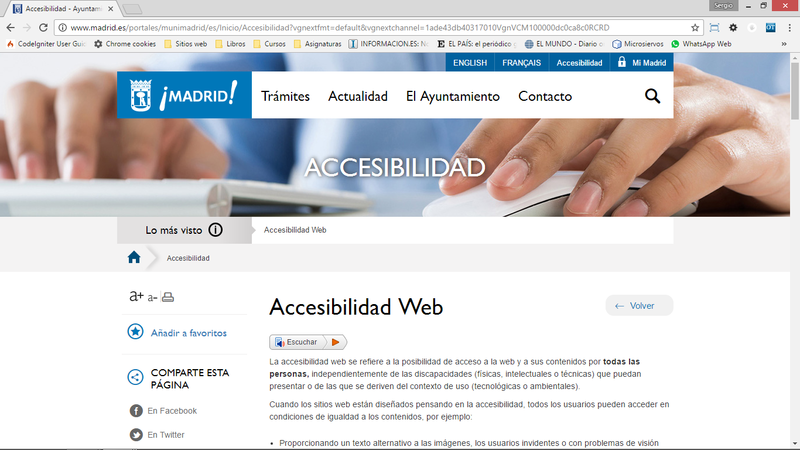 Es una aplicación del sistema preinstalada en la mayoría de los dispositivos que se actualiza cuando hay mejoras disponibles para el servicio de accesibilidad. Cuando TalkBack está activado, el dispositivo habla y describe cada uno de los elementos que son seleccionados o activados. Se trata de una ayuda por voz que es capaz de leer lo que ocurre en el teléfono e ir guiando al usuario en su navegación por los menús y las aplicaciones. En ese momento, el smartphone te ofrece una sencilla y breve guía narrada de cómo sacar partido a la herramienta y cuáles son los gestos adecuados para desplazarte por la pantalla. Además, podrás definir algunos ajustes, como el volumen de la voz o en qué momentos no quieres que TalkBack esté activado (cuando acercas el teléfono al oído, gracias al sensor de proximidad, por ejemplo). Por motivos de seguridad y para proteger datos sensibles, TalkBack no lee contraseñas o números de tarjetas de crédito. 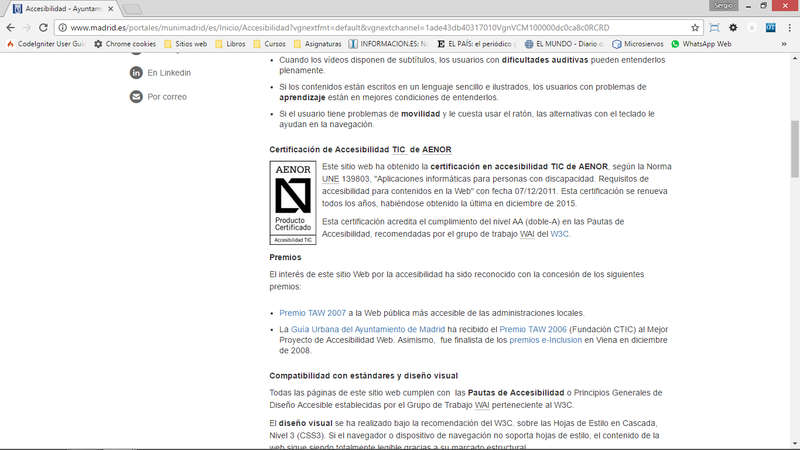 Logo de certificación TIC AENOREste sitio web ha obtenido la certificación en accesibilidad TIC de AENOR, según la Norma UNE 139803, "Aplicaciones informáticas para personas con discapacidad. Requisitos de accesibilidad para contenidos en la Web" con fecha 07/12/2011. Esta certificación se renueva todos los años, habiéndose obtenido la última en diciembre de 2015.